WHAT TO BRING: Full scuba equipment including regulator with pressure gauge, depth gauge, compass and octopus, buoyancy compensator with power inflator, timing device/computer, weight belt, and wet suit. A 10% student discount is available on equipment rentals and up to 20% on equipment purchases. WHAT TO EXPECT: The PADI Divemaster Course is designed to train qualified Rescue Divers in how to control, manage and supervise groups of divers. 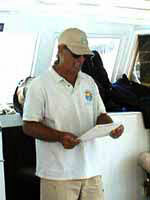 This 3 module course provides extensive development of ones diving skills, stamina and theoretical diving knowledge. The swim test involves a 400 yd swim; an 800 yd mask, fin, snorkel swim; a 100 yd tired diver tow in full equipment; and a 15 min tread all of which are time based evaluation. There are also extensive written exams covering the areas of physics, physiology, equipment, dive management, supervision, skills & environment, and dive tables. Upon successful completion of the course, the student is certified as a PADI Divemaster and qualifies for PADI Membership and attendance at a PADI Instructor Development Course (IDC). COST: $899.00 (based on 2 person minimum). Does not include materials or e-Learning fees payable to PADI. HOW TO REGISTER: A $300.00 deposit. Upon receipt, we will send you your course assignments and itinerary sheet. Complete payment is required two weeks prior to the course starting date. MEDICAL FORM: If applicant signs “yes” to any of the medical history questions, please consult your physician for approval. Click here to download the Medical Statement Form.